rodpedersen.com: REPORT: RICKY RAY DONE FOR THE SEASON, DURANT AN OPTION? 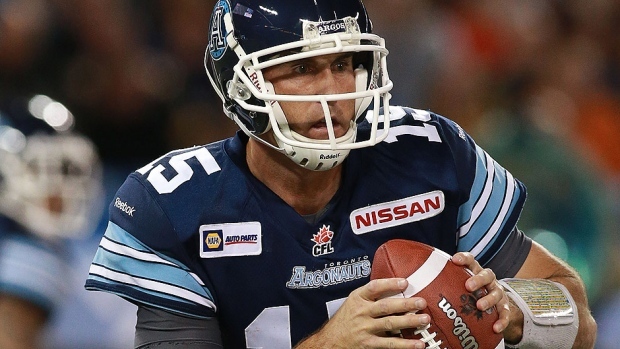 REPORT: RICKY RAY DONE FOR THE SEASON, DURANT AN OPTION? Toronto Argonauts quarterback Ricky Ray's status for this weekend's game against Hamilton is uncertain due to an injury that prevented him from participating in Thursday's practice. Head coach Scott Milanovich said Ray is "very sore'' with an upper-body injury, but did not provide further details. Montreal Gazette football writer Herb Zurkowsky reports Ray has sustained a punctured lung and is done for the year. A team official later said Milanovich was expected to address Ray's injury situation on Friday after practice. It's unknown when Ray suffered the injury. He went the distance in Monday night's 49-36 road loss to the Hamilton Tiger-Cats. Speculation is mounting that the Toronto Argonauts could look to the Saskatchewan Roughriders to help salvage their season. With the Riders nearly out of playoff contention at 1-9 and quarterback Darian Durant's contract expiring at season's end, it could make sense for Saskatchewan to ship Durant to Toronto as "a rental". Under that scenario, Durant could play out the season with Toronto but sign back with Saskatchewan once his contract expires in February. Ricky Ray has had a string of very bad luck. Unfortunate for the Argos and the CFL. Still a young man with a few good years left. Darian's value has just increased. Get the deal done with Doubles sooner rather than later. With Durant or for Durant? I wonder what the Argos would offer? If this season is truly over, I could see Durant being a rental to the Argos and then possibly resign back here in the off season. Toronto has something to play for still. But Toronto may open up the bank to keep him giving us no other option than to go to Edm again with their backup. Durant may enjoy not living in a fishbowl and do much better. Don't really want him to go anywhere but as a rental for half a season, that would be ok. When Ray gets hurt two years in a row, it's a string of bad luck. When Durant gets hurt, he's made of glass. Yeah, but it is what it is. Calm down, dom. Calling Durant a "rental" is not a comment on his ability - it is actually recognition that he is a valuable player who happens to have an expiring contract. Trading Durant to a team that might still have an outside shot at the playoffs might just be the best thing for everyone involved. The Riders would be able to spend the rest of the season developing a capable backup QB to eventually replace him (Durant *is* in the waning years of his career, don't kid yourself that he's not), Durant will still get another shot at another ring (something he doesn't have right now), and the Argos or the Als (either team could do with a decent QB right now) could have a better shot at the cup. Durant staying on the Riders for the rest of the season isn't even helpful to Durant *or* the Riders. You can't play both QBs for the rest of the season and expect to get proper development time in, so you'd either be benching Durant for the rest of the season, benching a QB you should be developing for the rest of the season, or half-assing your QB development for the rest of the season. I know this looks like Messam all over again - and maybe it is - but you have to realize that the likelihood of Messam coming back to the Riders fold was no different after the trade to Calgary as it was before. This is the same with Durant. We may not make it into the playoffs, but we could still be enough of an irritant to other teams later this season. I don't want Darian to go to Toronto. But, it looks like the vultures are already circling, looking for any tasty morsels to chew on. Last year, we lost Messam and Kevin Glenn, as the feeding frenzy started. not worth the risk to trade he might not resign. yeah Like Messam trade but on a way bigger risk scale. QB's much harder to find than tailbacks. You would think. That's my point though, CM. The risk to Durant not re-signing next season is the same whether he is traded or not. He's a free agent after this season and can go wherever he wants. Think of this from Durant's perspective - the season is over for the Riders. The rest of the season is development time. You're not going to be effectively utilized for the rest of the season and you have no chance of even a single playoff down this year with the team you're on. You have a chance, though, of helping another team succeed this season and possibly make a run for the cup - you just have to wear another team's jersey for eight games (ten or eleven if you make it all the way). It is on the new GM of your team (who, by the way, asked you to take a pay cut to even stay on the team this season) to trade you to get that chance. Do you think you'd be more inclined to re-sign with your team if they gave you that chance, or would you be more inclined to re-sign if they selfishly kept you to themselves and then benched you for the rest of the season so they could develop the backup QB? Either way, the risk that Durant will re-sign with another team is 100% due to his contract expiring this year. Trading him to another team isn't going to reduce that risk at all. If Durant wants to return to Regina (and I believe he does), he'll make it happen. Just saw Durant at airport. Travel changes. Enroute to Toronto. Sad day. He is gone, Jones Ego will make sure double D is in double blue just so Jones can blow out any and all Riders left from the good old days. Jones loves to make big changes and so far nothing has worked!! Would think if Toronto was interested in a QB seeing Ray is done for the year and with his age maybe its time for him to retire...maybe throw try to trade for Franklin which could make up some ground on losing Harris.